« PRAYER: DOES IT MAKE ANY DIFFERENCE? Did you know Internet Explorer is out of fashion? 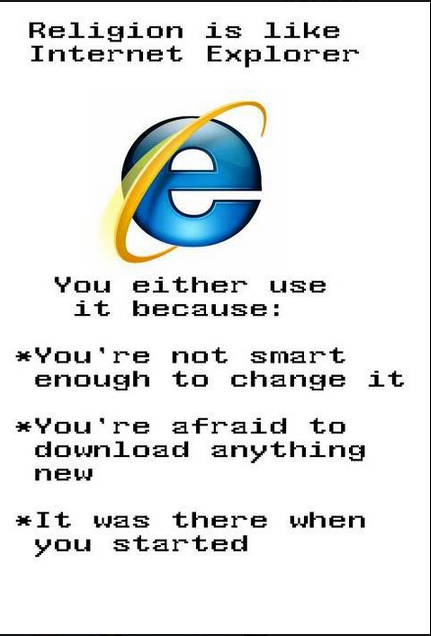 I didn’t, but then again, I’m a Mac person and Internet Explorer hasn’t bothered with us for years. But what about the points that people of faith apparently have in common with Internet Explorer? According to this graphic, posted on an Atheism Internet community, people like me are dumb, frightened and unwilling to question anything they grew up with. This dude went to church as a child, but at the age of 16, his parents told him and his two brothers they were free to continue with faith, or drop it. The decision was unanimous. The entire family walked away from even the shallowest pretense of faith. For this one dude, it never came to a point of becoming an atheist, but he did get very angry at God and figured people who followed Jesus Christ (whom serious Christians believe is God’s Son) were either naive children or frightened seniors. That kind of attitude made him unpleasant to be around. And he knew it. Then the day came, at age 42, when he became willing to change, willing to download something new, willing to seriously investigate what was there when he started. After much discussion with mature, respectful Christians, much reading of a wide variety of books from several very different points of view and after much thoughtful consideration, he decided to become a Christ follower. Do I have all my questions answered? Nope. Do I understand everything in the Bible? Hardly. In the end, when I’m finished with this life, will either of these points matter? Not even a bit. Because I accepted God’s gift to humanity (Jesus), I also accepted that He sacrificed His life for all the bad things I’ve done and all the good things I’ve failed to do. My slate is wiped clean. And as a result, I’ll spend eternity with Him in Heaven. Does that mean I can just walk away and do whatever I want? Not unless I’m seriously deluded. If I take God’s gift seriously, then I’m overwhelmingly grateful for what Jesus has done. That gratefulness opens the door for me to welcome Him into my heart and soul. Now He’s working to make me a better person – to myself, to my wife and stepchildren, to my parents and to everyone who doesn’t share my trust and faith in Him. That gift is waiting for you, too. No matter what you’ve done (or not done), no matter how much you struggle with life. Interested? Post your thoughts below and let’s have a conversation. With all due respect, that very much sounds like accepting a delusion, lying to yourself, just so you can live without remorse and fear, as you’ll be spending eternity in heavens. You should not need the promise of a reward to become a better person. This is a very selfish behavior and in direct contradiction with the concept of being a “better person”. One can seek to become a better person for the benefit of oneself, and for the benefit of the people we love. Once again, god is not necessary for self-improvement. For some people, God is, indeed, not necessary for self-improvement, Bruce. But for many, many others, He’s the only thing that’s gonna make a difference. And part of me seeking to become a better person is for the benefit of myself and for others. So we’re in agreement there. I think some people mistake religion for relationship. What we have when we choose to ask Jesus into our lives is a deep and intimate relationship with God through Him. We can’t help but change for the better! God does want the very best for His children. P.S. 42? Wow! I was 30, and sounded a whole lot like Alexis before Jesus found me. Great thoughts, Martha. Only I’d go further and say *most* people mistake religion for relationship. I too can identify with your journey as I had very similar experiences – although it took me even longer (54). But, as you say, better late than never! Some gift. Who the hell wants some poor guy tortured and murdered as an Easter present? You are certainly welcome to reject the gift, Jimmy. Just make sure you are prepared to defend every bad thing you’ve done in your life — and that includes lots of things you and our culture don’t regard as bad. As well, you’ll need to account for every good thing you’ve failed to to do. I don’t envy you such an overwhelming and intimidating task. I have been a “man of faith” since there was Latin Mass. I have struggled in life, just as many have. My Love for God does not have much to do with my accomplishments in the “material world” but rather in my own relationship with God himsel. I want to be a better person to also receive what He promises, His peace and His strength to resist temptations that would make my soul get lost…and guess what, the devil hates that. The enemy will do everything possible to make you reject God and God’s precepts. It’s up to us to seek the things from above or get stock in the ones that leads no where but to the netherworld.